White Label Communications (WLC) provides Private Label Dial Tone to it's partners through a global hosted PBX and SIP Trunk solution. Through the WLC platform Interconnects and Managed Service Providers can become their own phone company. Finally, there is a reliable way to connect fax machines to VoIP. 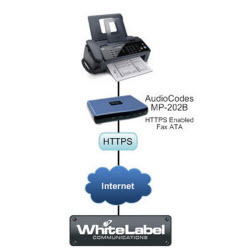 The new Fax ATA uses secure HTTPS to reliably send faxes in real-time over any data connection (Internet, Cellular, and Satellite) while adding new VoIP features to the fax machine like automatic fax archiving and email notifications. Delivering faxes over traditional SIP Trunks is unreliable, unsecure, and bandwidth intensive.